Dangerous avalanche conditions. The avalanche danger is CONSIDERABLE on and below the steep, wind drifted slopes at mid and upper elevations. Human triggered avalanches are likely and natural avalanches possible. Some avalanches may be triggered at a distance or from below. Be aware of what is above you, and avoid travel in avalanche runout zones such as the bottom of gullies and couloirs and travel below slopes being loaded by the wind. The growing cornices are unstable, and will break back further than expected. The southerly winds cranked up yesterday - averaging 35 to 40 mph, and gusting into the 50s and 60s along the high ridge lines. The winds were getting well down into the mid elevations. Non-stop avalanche activity yesterday, with the focus on wind drifted slopes facing north through easterly. 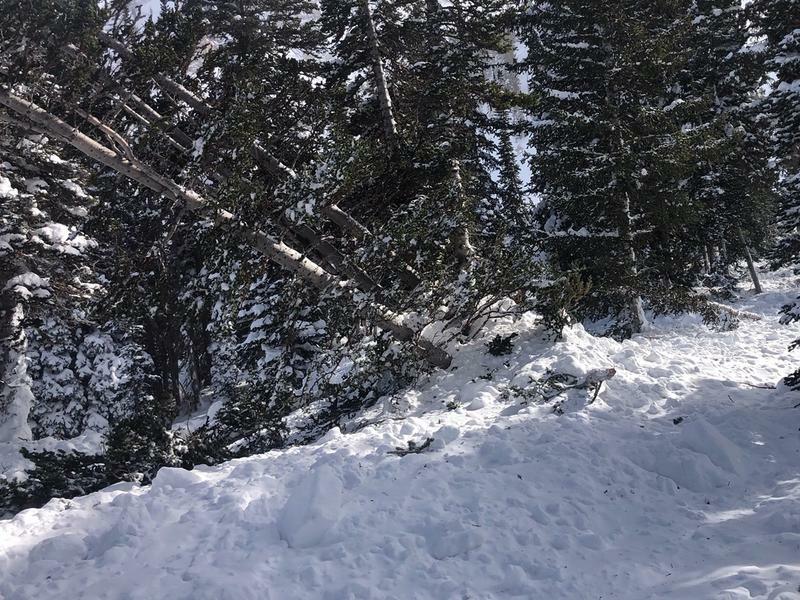 Natural avalanches up to 2 feet deep and large enough to bury a person were reported in Mineral, upper Little Cottonwood, Primrose Cirque, and Mill B. 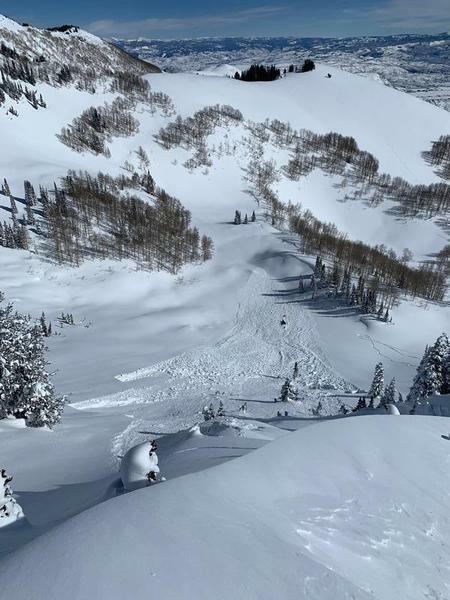 Explosives in the resorts and American Fork backcountry were able to pull out wind slabs and deep, wide avalanches, some breaking to the ground on facets - some were repeaters, others not. Human triggered slides included another on Pioneer (10,400’, North facing, 2” deep by 100’ wide), a slide remotely triggered off Preston Peak, on a south easterly facing slope, about 3’ x 100’ and the Moonlight headwall. Photo 1 and 2 - LARGE, deep, explosive triggered slides. Photo 3 - Preston peak, down into Snake creek, Daniel Cottam photo. Note the cracks. 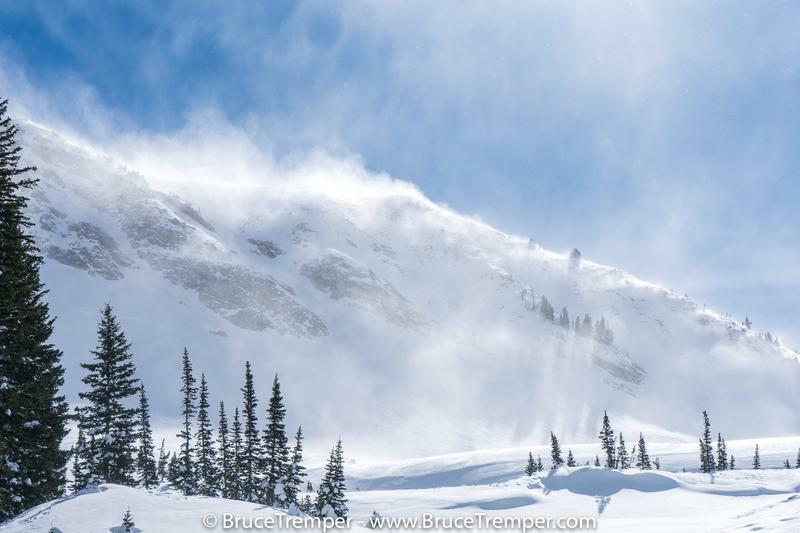 The widespread, new wind drifts are the number one avalanche concern today. Moderate to strong southwesterly winds have drifted the snow at both mid and upper elevations into soft to hard drifts. The cracky drifts will be easily triggering on steep slopes, and it will be possible to trigger these new drifts from a distance or from below. Drifts will be most widespread on north through easterly facing slopes. However, the winds can deposit snow around terrain features on almost any aspect, called cross loading. Human triggered avalanches are likely today on wind drifted slopes and natural releases possible as today’s wind continues to drift the snow. Weak surface snow and patches of surface hoar were buried Saturday night. Avalanches triggered on these layers have been 1-3' deep on wind drifted north to easterly facing slopes with elevations from 8800' to 10,200'. Some of these have run naturally, some of been triggered at a distance. Cracking/collapsing are key indicators here; in snowpits, look for the 'thin grey line' a couple feet down in the snowpack. Slides failing on faceted weak layers can be triggered from a distance, including from below. Enough snow and wind have tipped the balance in some areas to produce avalanches down near the ground 3-6' deep. While more likely to occur on slopes that have avalanched previously, two of yesterday’s explosive triggered slides were on slopes that had not slid this winter. These deep slides may require more of a significant trigger, perhaps a triggered wind slab stepping down or cornice fall. Odd areas with traditionally shallow snowpacks such as Lambs, parts of Mill Creek, No Name or Snake Creek are more suspect.